Their marriages are two of the most talked about in Hollywood, but there's something else Isn't It Romantic co-stars, Priyanka Chopra Jonas and Liam Hemsworth have in common -- finding love with former Disney stars! The newlyweds (Jonas recently wed singer Nick Jonas, while Hemsworth tied the knot with Miley Cyrus in December,) star alongside Rebel Wilson and Adam DeVine in the new flick, out on Feb. 13, and the co-stars addressed Jonas and Hemsworth's Disney spouses while talking to ET's Lauren Zima. “Definitely when Jonas Brothers first came out -- I was like, ‘Yeah!’” Wilson said. 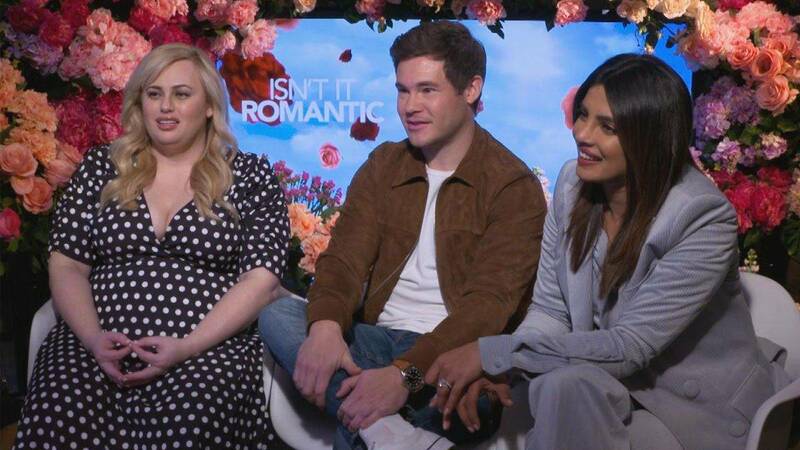 Isn't It Romantic is set to be a Valentine’s Day must-see for rom-com lovers, but little did Chopra realize when she was filming it that by the time the film hit theaters, her real-life romance would be the talk of Tinseltown. Asked whether Jonas, 26, gave her any pointers while she prepared for musical scenes, she confessed she was just another 30-something questioning the direction of her life at the time of filming. Chopra and her co-stars then joked that working on a romance movie meant it was only natural that real-life love followed. The cast also opened up about some of the romantic gestures which have left a mark on their own love lives. Wilson shared how she was recently sent cookies in London, and thought the gesture was “excellent,” despite the treats getting moldy while being held up in customs. But it was Chopra who will no doubt stir envy with her grand gesture from Jonas the night before their wedding. “No wonder you went through with the marriage,” responded Wilson, who plays Natalie in the film, an architect who gets knocked out during a mugging on the subway and wakes up in an alternative universe where she’s the lead in a real-life romantic comedy. Hemsworth plays her love interest and while he was said to be apprehensive about the dancing involved with the role, Chopra revealed he got “fully” into it eventually. “He got into it! I think he practiced when he went back into the restroom,” she said. “He had such a great time. You could see it and he was right next to me and he was like fully into it. “I know Liam was scared about it but when you saw him doing it you could tell he was really having fun,” reiterated DeVine, 35. See more on Chopra's love life below.